We've all heard the phrase 'you are what you eat' before & it certainly rings true when talking about skincare. Changing certain aspects of my diet has personally helped me to combat issues with acne & eczema. Some changes can be as simple as avoiding dairy products but for other benefits supplements are a fantastic way to improve your diet & overall health. The latest trend in health supplements are collagen drinks as a tastier method of ingesting nutrients that claim to support beauty from within. I take a variety of daily supplement pills from Holland & Barrett but I've never tried a beauty drink before. 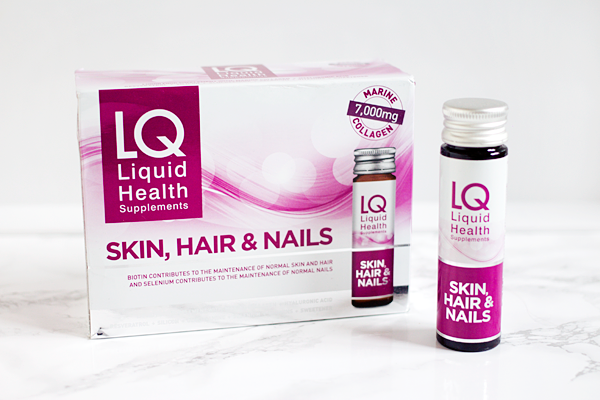 LQ Liquid Health offered to send me a month's supply of their Skin, Hair & Nails liquid supplement & I was very eager to give it a go. As we age our natural collagen levels start to decrease resulting in loss of moisture, reduced elasticity and the development of fine lines & wrinkles. This apparently happens around the age of 25 & at 28 I can already tell that my skin no longer looks quite as youthful (even though I still get spots!). Ingesting liquid collagen provides the entire body with the building blocks it needs to support the creation & repair of the body's connective tissues. These beauty drinks allow the collagen peptides to be delivered straight into the bloodstream to directly encourage the skin to produce more collagen & hyaluronic acid. This helps to inhibit the ageing process by boosting the skin's hydration levels whilst plumping & firming it up in the process. 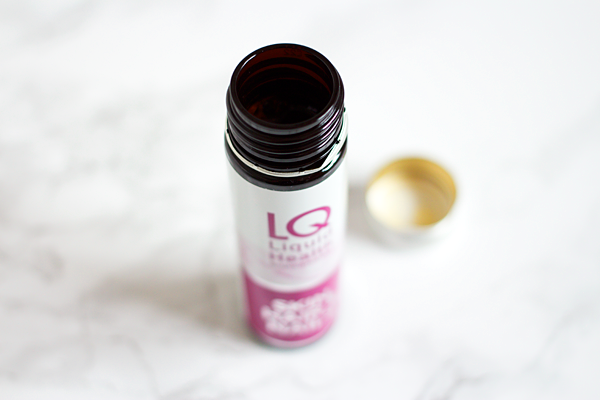 The main benefit of drinking these bottles over taking a pill is that you get a whopping 7000mg of hydrolysed marine collagen in each one which is clinically proven to have a positive effect on your skin, hair & nails. LQ use Peptan® which is a high quality source of collagen containing more than 97% protein & it can be easily digested by the body. As well as collagen these supplements provide eight other important nutrients, all of which contribute towards the maintenance of healthy skin, hair & nails. These include hyaluronic acid, resveratrol, silicon & glucosamine. I'm sure we all know about about the wonders of hyaluronic acid by now. It's great for hydrating & plumping up the skin but it also helps to lubricate your joints. Resveratrol is a natural antioxidant with scientifically proven anti-ageing, anti-inflammatory, anti-cancer & life-prolonging effects. Silicon contributes to the strength, integrity & growth of connective tissues including skin, hair & nails. Glucosamine is a substance found in the fluid around your joints and supplementing your diet with it can help with joint pain & general joint health. I'd definitely recommend it if you're into training at the gym. In addition to these key active ingredients they also feature Vitamin C, Vitamin E, Selenium & Biotin. 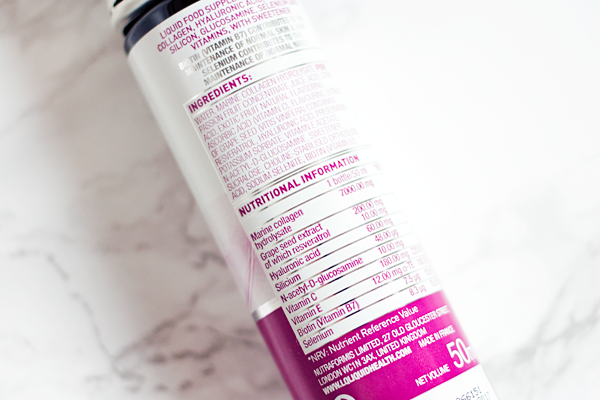 These beauty drinks are simply packed full of good stuff to help your body out! 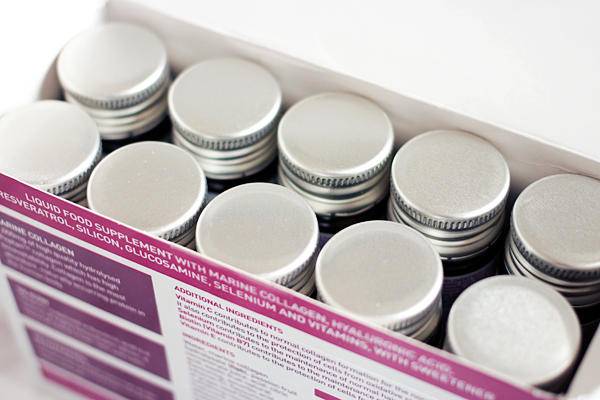 Each bottle of Skin, Hair & Nails contains 50ml of liquid vitamin supplement. You're supposed to drink one bottle per day for at least one month in order to see results. The drink itself has a fairly pleasant passion fruit flavour. There was a bit of a metallic aftertaste which kinda reminded me of these chewable zinc pastilles that my mum forced me to take as a child whenever I got poorly. Luckily you can down these little bottles like a shot so the taste doesn't last long & you can chase them with whatever drink you like. I always took them straight after breakfast so I wouldn't forget. It took quite a while for me to notice a difference but by the fourth week of my trial I could tell that my skin looked plumper & felt better hydrated. These supplements also put paid to the fine lines on my forehead. I kept the rest of my topical skincare routine the same throughout so I do think that these drinks made a difference in that respect. As my hair is bleached it's quite easy to keep track of my hair growth from my dark roots. This was definitely faster than usual & the new hair felt stronger too. For some reason my nails didn't seem to benefit in the same way. They broke off the same amount as usual & grew at the same rate. Perhaps they would improve with further use. Since finishing the month long trial my skin seems to have gone back to the way it was before with a bit of sagging & fine lines creeping back in. LQ suggest continuing to supplement with 3 or 4 bottles per week to maintain the benefits. However the main downside to these supplements is that they are quite expensive. Each box costs £30 & you only get 10 bottles for that price. Therefore it would cost you £90 for just one month. If you purchase them directly from LQ Liquid Health you can get 3 for the price of 2 so it's a much better deal but still an expensive thing to try out. Nonetheless, if you can afford it & want to suppress the visible signs of ageing or simply want healthier looking skin, these little bottles are definitely worth the investment.